There is a serious law of diminishing returns with these Night at the Museum films. The first one was cute, the second was okay and this third installment seems to be living out its own plot – losing the magic altogether. The basic premise of all these films is there’s a magic tablet which, for some reason, when the sun goes down imbues non-living things with life. This isn’t a case of bringing things back from the dead (although that does happen), no, this is a case of anything around is suddenly moving. 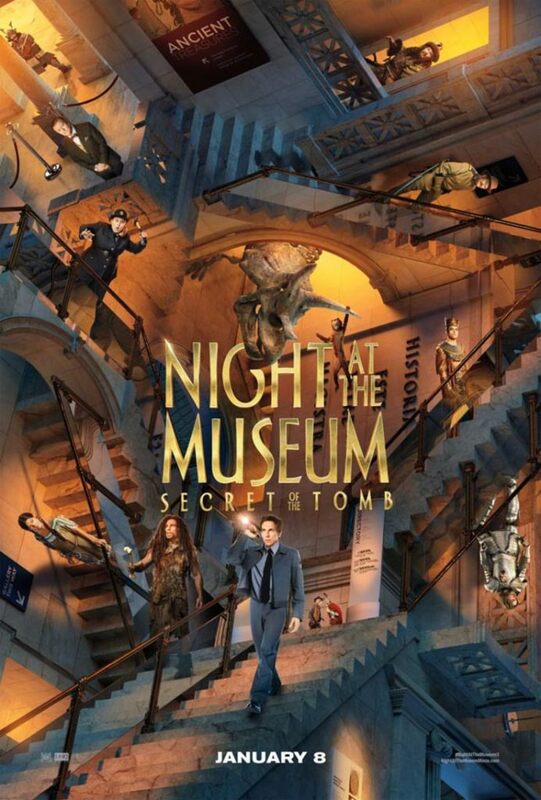 Now, in the third film, Night at the Museum: Secret of the Tomb, the secret of the tablet is finally revealed as some mysterious malady is overtaking it, a weird fungus like mold is covering it, draining it of its magical properties. It’s now up to Ben Stiller‘s Larry Daley to figure out the problem and fix it before the magic goes away completely. It turns out the answer is in England, at the British Museum, where the parents of ancient Egyptian and tablet owner Ahkmenrah (Rami Malek) are on display. Off they go, the whole gang from the past two films including Owen Wilson, Steve Coogan, and the late, great Robin Williams, once again playing Teddy Roosevelt. Also along is Daley’s son, Nick (Skyler Gisondo) who is going through his own coming of age crises allowing for multiple plot point to center on the idea of dads and sons and letting go. All of these things are fine, but what really kills this film is inanity of it. I know, that’s a silly thing to complain about in a Ben Stiller film where a magic tablet brings everything under the moon to life, but at least in the first two installments, the premise was treated with respect and some level of reality. Anything can work, no matter how ridiculous the premise, if you keep your reality consistent. That doesn’t happen here. The laws of physics are constantly being broken (which only works in the one sequence where they all end up inside the M.C. 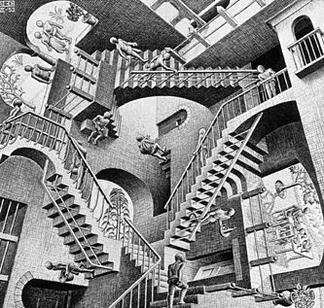 Escher print Relativity, ) and, ultimately, the internal logic of the tablet itself falls apart. Add into this the new character of Lancelot (Dan Stevens) who starts off okay but then turns into a pastiche of his chivalric namesake, an out of left field cameo by Hugh Jackman and Ben Stiller in a dual role as a Neanderthal called Laaa and you have a hot mess (to be honest, I’m liking Stiller less and less these days – he’s forgone his talent for mugging and he’s not good at it). All of this isn’t to say there are no good moments. Ben Kingsley as the original commissioner of the tablet, the Pharaoh Merenkahre just goes to show that a good actor can make anything work. The effects are delightful and there are a few genuine moments in the film – although I’d wager they slipped in by accident. It seems like director Shawn Levy (who did the previously reviewed ) has lost control of the ship here. He’s hanging with friends (the ones who weren’t in the previous films, were in other films Levy has directed) and so while everyone is having a good time, no one is actually making sure a coherent film is being made. In the end, it’s not a bad film, just not a particularly good one. It’s the kind of film the kids will like (there’s a peeing monkey, what’s not to like) and will easily and innocently eat up 90 minutes on a rainy afternoon. While I will admit that this movie wasn’t as good as the first two, I still loved it. It was still magical to me, but that could also be because I hold the magic for these movies within me so I was able to project that back onto the screen while watching it. I knew I was going to cry at this movie but I cried far more than I expected to, and it was the story that made me cry. Because it was ending, because it was over. The farewell scenes were done very well I thought, a lot of emotion in most of them. Ben Kingsley certainly was a stand out for sure though, but isn’t he always? I would say more of what I loved about the movie but I don’t want to give more away than I may already have.